For two weeks in August 1936, Adolf Hitler's Nazi dictatorship camouflaged its racist, militaristic character while hosting the Summer Olympics. Soft-pedaling its antisemitic agenda and plans for territorial expansion, the regime exploited the Games to bedazzle many foreign spectators and journalists with an image of a peaceful, tolerant Germany. Having rejected a proposed boycott of the 1936 Olympics, the United States and other western democracies missed the opportunity to take a stand that — some observers at the time claimed — might have given Hitler pause and bolstered international resistance to Nazi tyranny. With the conclusion of the Games, Germany's expansionist policies and the persecution of Jews and other “enemies of the state” accelerated, culminating in World War II and the Holocaust. On May 13, 1931, the International Olympic Committee, headed by Count Henri Baillet-Latour of Belgium, awarded the 1936 Summer Olympics to Berlin. The choice signaled Germany's return to the world community after defeat in World War I. Two years later, Nazi Party leader Adolf Hitler became chancellor of Germany and quickly turned the nation's fragile democracy into a one-party dictatorship. Police rounded up thousands of political opponents, detaining them without trial in concentration camps. The Nazi regime also put into practice racial policies that aimed to “purify” and strengthen the Germanic “Aryan” population. A relentless campaign began to exclude Germany’’s one-half million Jews from all aspects of German life. The Nazification of all aspects of German life extended even to sport. A staunch Nazi close to Hitler, Hans von Tschammer und Osten, headed the Reich Sports Office, which oversaw all sports bodies and clubs, including the German Olympic Committee planning the 1936 Games. The government harnessed sport as part of its drive to strengthen the “Aryan race,” to exercise political control over its citizens, and to prepare German youth for war. “Non-Aryans” — Jewish or part-Jewish and Gypsy (Roma) (Roma) athletes — were systematically excluded from German sports facilities and associations. They were allowed marginal training facilities, and their opportunities to compete were limited. German sports imagery in the 1930s promoted the myth of Aryan racial superiority and physical power. Artists idealized athletes' well-developed muscle tone and heroic strength and accentuated so-called Aryan facial features — blue eyes and blond hair. Such imagery also reflected the importance the Nazi regime placed on physical fitness. Hitler initially held the Olympics in low regard because of their internationalism, but he became an avid supporter after Joseph Goebbels, his Minister of Propaganda, convinced him of their propaganda value. The regime provided full financial support for the event, 20,000,000 Reichsmarks ($8,000,000). Jewish athletes, barred from German sports clubs, flocked to separate Jewish associations, but Jewish sports facilities were no match for those of the well-funded German groups. Gretel Bergmann was a world-class high jumper who was expelled from her sports club in Ulm in 1933. Afterwards, she trained briefly with the Stuttgart branch of Der Schild (The Shield), a sports association organized under the auspices of the Jewish Association of War Veterans. 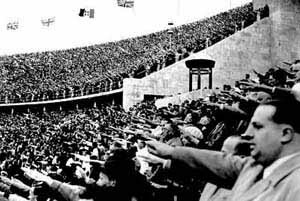 Soon after Hitler took power in 1933, observers in the United States and other western democracies questioned the morality of supporting Olympic Games hosted by the Nazi regime. Responding to reports of the persecution of Jewish athletes in 1933, Avery Brundage, president of the American Olympic Committee, stated: “The very foundation of the modern Olympic revival will be undermined if individual countries are allowed to restrict participation by reason of class, creed, or race.” Brundage, like many others in the Olympics movement, initially considered moving the Games from Germany. After a brief and tightly managed inspection of German sports facilities in 1934, Brundage stated publicly that Jewish athletes were being treated fairly and that the Games should go on, as planned. Debate over participation in the 1936 Olympics was greatest in the United States, which traditionally sent one of the largest teams to the Games. By the end of 1934, the lines on both sides were clearly drawn. Brundage opposed a boycott, arguing that politics had no place in sport. “The Olympic Games belong to the athletes and not to the politicians.” He wrote in the AOC's pamphlet Fair Play for American Athletes that American athletes should not become involved in “the present Jew-Nazi altercation.” As the Olympics controversy heated up in 1935, Brundage alleged the existence of a “Jewish-Communist conspiracy” to keep the United States out of the Games. Brundage's rival, Judge Jeremiah Mahoney, president of the Amateur Athletic Union, pointed out that Germany had broken Olympic rules forbidding discrimination based on race and religion. In his view, participation would mean an endorsement of Hitler's Reich. Beginning in 1933, the American Jewish Congress and the Jewish Labor Committee, joined by the non-sectarian Anti-Nazi League, staged mass rallies to protest Nazi persecution of Jews, political opponents, and others. These groups supported the boycott of the 1936 Games as part of a general boycott of German goods. Other Jewish groups, such as the American Jewish Committee and B'nai B'rith, did not formally support a boycott, in part because they feared that such a posture might trigger an antisemitic backlash in both the United States and Germany. Individual Jewish athletes made their own decisions. For example, Milton Green, captain of the Harvard University track team, took first place in the 110-meter high hurdles in regional pre-Olympic trials. His teammate, Norman Cahners, also Jewish, qualified for the final Olympics trials as well. Both chose to boycott the national Olympic trials. Many of the liberal and left-wing political groups that denounced Hitler's fascist dictatorship linked their opposition to the Berlin Olympics with the wider economic boycott of Germany. After concerns about the safety of Black athletes in Nazi Germany were put to rest by the International Olympic Committee, most African American newspapers opposed a boycott of the 1936 Olympics. Black journalists often underscored the hypocrisy of pro-boycotters who did not first address the problem of discrimination against Black athletes in the United States. Writers for such papers as The Philadelphia Tribune and The Chicago Defender argued that athletic victories by Blacks would undermine Nazi racial views of “Aryan” supremacy and foster a new sense of Black pride at home. In the end, 18 African Americans — 16 men and 2 women — went to Berlin, triple the number who had competed for the United States in the 1932 Los Angeles Games. That all of these athletes came from predominantly white universities demonstrated to many Black journalists the inferiority of training equipment and facilities at black colleges where the vast majority of African American students were educated in the 1930s. Ernest Lee Jahncke, a former assistant secretary of the Navy, of German Protestant descent, was expelled from the International Olympic Committee (IOC) in July 1936 after taking a strong public stand against the Berlin Games. The IOC pointedly elected Avery Brundage to fill Jahncke's seat. Jahncke is the only member in the 100-year history of the IOC to be ejected. Short-lived boycott efforts surfaced in Great Britain, France, Sweden, Czechoslovakia, and the Netherlands. German Socialists and Communists in exile voiced their opposition to the Games through publications such as Arbeiter Illustrierte Zeitung (The Worker Illustrated Newspaper). Some boycott proponents supported counter-Olympics. One of the largest was the “People's Olympiad” planned for summer 1936 in Barcelona, Spain; it was canceled after the outbreak of the Spanish Civil War in July 1936, just as thousands of athletes had begun to arrive. Individual Jewish athletes from a number of European countries also chose to boycott the Berlin Olympics. On December 8, 1935, the Amateur Athletic Union defeated the proposal to boycott the Olympics by two-and-a-half votes. Avery Brundage maneuvered the vote to achieve a victory. At no time did President Franklin D. Roosevelt become involved in the boycott issue, despite warnings from high-level American diplomats regarding Nazi exploitation of the Olympics for propaganda. Roosevelt continued a 40-year tradition in which the American Olympic Committee operated independently of outside influence. Once the Amateur Athletic Union of the United States voted for participation in December 1935, however, the other countries fell in line. Forty-nine teams from around the world competed in the Berlin Games, more than in any previous Olympics. Germany had the largest team at the Berlin Games with 348 athletes. The United States had the second largest team with 312 members. The Soviet Union did not participate in the Berlin Games or any Olympiad until the 1952 Helsinki Games. Germany skillfully promoted the Olympics with colorful posters and magazine spreads. Athletic imagery drew a link between Nazi Germany and ancient Greece. These portrayals symbolized the Nazi racial myth that superior German civilization was the rightful heir of an “Aryan” culture of classical antiquity. The Nazis reduced their vision of classical antiquity to ideal “Aryan” racial types: heroic, blue-eyed blonds with finely-chiseled features. From February 6 to February 16, 1936, Germany hosted the Winter Olympics at Garmisch-Partenkirchen in the Bavarian Alps. Yielding to international Olympic leaders' insistence on “fair play,” German officials allowed Rudi Ball, who was half-Jewish, to compete on the nation's ice hockey team. Hitler also ordered anti-Jewish signs temporarily removed from public view. Still, Nazi deceptions for propaganda purposes were not wholly successful. Western journalists observed and reported troop maneuvers at Garmisch. As a result, the Nazi regime would minimize the military's presence at the Summer Olympics. In August 1936 Olympic flags and swastikas bedecked the monuments and houses of a festive, crowded Berlin. Most tourists were unaware that the Nazi regime had temporarily removed anti-Jewish signs. Neither would tourists have known of the “clean up” ordered by the German Ministry of Interior in which the Berlin Police arrested all Gypsies prior to the Games. On July 16, 1936, some 800 Gypsies were arrested and interned under police guard in a special Gypsy (Roma) (Roma) camp in the Berlin suburb of Marzahn. Also in preparation for the arrival of Olympic spectators, Nazi officials ordered that foreign visitors should not be subjected to the criminal strictures of the Nazi anti-homosexual laws. The Reich Press Chamber under Joseph Goebbels's Ministry of Propaganda exerted strict censorship over the German press, radio, film, and publishing. The Chamber issued numerous directives regarding coverage of the Olympic Games, limiting the scope and content of reporting by German journalists. On August 1, 1936, Hitler opened the XIth Olympiad. Musical fanfares directed by the famous composer Richard Strauss announced the dictator's arrival to the largely German crowd. Hundreds of athletes in opening day regalia marched into the stadium, team by team in alphabetical order. Inaugurating a new Olympic ritual, a lone runner arrived bearing a torch carried by relay from the site of the ancient Games in Olympia, Greece. Eighteen Black athletes represented the United States in the 1936 Olympics. African American athletes won 14 medals, nearly one-fourth of the 56 medals awarded the U.S. team in all events, and dominated the popular track and field events. Many American journalists hailed the victories of Jesse Owens and other Blacks as a blow to the Nazi myth of Aryan supremacy. Goebbels's press censorship prevented German reporters from expressing their prejudices freely, but one leading Nazi newspaper demeaned the Black athletes by referring to them as “auxiliaries.” The continuing social and economic discrimination the Black medalists faced upon returning home underscored the irony of their victory in racist Germany. Two weeks before the Olympics began, German officials informed Gretel Bergmann, a Jewish athlete who had equaled the German women's record in the high jump, that she was denied a place on the team. As the winning jump at the Olympics had been attained by Bergmann earlier, the Germans sacrificed a chance for a gold medal with this action. As a token gesture to mollify the West, German authorities allowed the half-Jewish fencer Helene Mayer to represent Germany in Berlin. No other Jewish athlete competed for Germany. Mayer claimed a silver medal in women's individual foil and, like all other medalists for Germany, gave the Nazi salute on the podium. Two-time European champion Ilona Schacherer-Elek, a part-Jew from Hungary won the gold medal and the bronze went to Ellen Preis, an Austrian, who was also of Jewish descent. After the Olympics, Mayer returned to the United States. In 1937, she won the world championship in Paris, defeating Schacherer-Elek. During the war, Preis was forced to go into hiding to avoid arrest and deportation. In the 1948 Olympics in London, Elek and Preis again won the gold and bronze medals respectively. Mayer returned to Germany in 1952 but died soon after of cancer. A controversial move at the Games was the benching of two American Jewish runners, Marty Glickman and Sam Stoller. Both had trained for the 4x100-meter relay, but on the day before the event, they were replaced by Jesse Owens and Ralph Metcalfe, the team's two fastest sprinters. Various reasons were given for the change. The coaches claimed they needed their fastest runners to win the race. Glickman has said that Coach Dean Cromwell and Avery Brundage were motivated by anti-Semitism and the desire to spare the Führer the embarrassing sight of two American Jews on the winning podium. Stoller did not believe anti-Semitism was involved, but the 21-year-old described the incident in his diary as the “most humiliating episode” in his life. Thirteen Jews or persons of Jewish descent won medals in the Nazi Olympics, including six Hungarians. Many Hungarian Jews shared their fellow citizens' passion for sport and viewed participation as a means of assimilation. In the 1930s, however, the anti-Semitic views of the fascist Hungarian government that developed close ties to Hitler's regime also pervaded some fields of sport. Fencing officials openly disdained Jews, even champion fencers such as Endre Kabos, who won the gold medal for Hungary in the individual and team saber events. “I'm afraid the Nazis have succeeded with their propaganda. First, the Nazis have run the Games on a lavish scale never before experienced, and this has appealed to the athletes. Second, the Nazis have put up a very good front for the general visitors, especially the big businessmen” (Shirer's diary, Berlin, August 16, 1936). As the post-Games reports were filed, Hitler pressed on with grandiose plans for German expansion. These included taking over the Olympics forever. Concerted propaganda efforts continued well after the Olympics with the international release in 1938 of Olympia, Leni Riefenstahl's controversial film documentary of the Games. The pause in the Germany's anti-Jewish campaign, however, was brief. William E. Dodd, the U.S. ambassador to Germany, reported that Jews awaited “with fear and trembling” the end of the Olympic truce. Two days after the Olympics, Captain Wolfgang Fürstner, head of the Olympic village, killed himself after he was dismissed from active military service because of his Jewish ancestry. In 1937, German Jewish track star Gretel Bergmann emigrated to the United States to escape persecution. Sources: U.S. Holocaust Memorial Museum. According to a relative of Ellen Preis, the athlete was forced to trace her family background to the 1600s to prove she was not in fact Jewish. In addition, Preis lived in Vienna with her family throughout the war. Other official sources maintain that Preis was Jewish.